Steve Scott Shooting for Gold. Steve beat compatriot Time Kneale to win the bronze medal in the Olympic double trap shooting event. Steve has done everyone in Sussex and Battle proud. Steve Scott born 10 January 1985 took part in the Olympic Double Trap. Beijing 2008 Olympian Steve Scott is a two-time European double trap champion having taken the title in 2008 and 2014. After finishing 12th at Beijing 2008, Scott went on to become a double Commonwealth gold medallist after clinching the double trap pairs title at Delhi 2010 alongside Stevan Walton and the individual accolade four years later at Glasgow 2014. 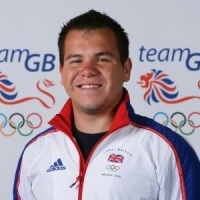 The Lewisham-born shooter competed as part of Team GB again at the inaugural Baku 2015 European Games, finishing fifth in the men's double trap, and rounded off his year in style by taking gold at the ISSF World Cup Final in Cyprus. A double World Championship bronze medallist, Scott secured the team's fifth quota spot for Rio 2016 with a silver medal win at the Gabala 2015 World Cup in August 2015. Good luck Steve we are all supporting you.